Under the leadership of Laurens van den Acker, Renault's Design Department has taken its inspiration from the brand's new signature Drive the Change and explores Renault's styling roots to express the company's powerful human dimension via a new strategy founded on the notion of 'the life cycle'. This vision also builds on the bonds that are gradually forged between the brand and its customers at watershed moments of their lives, such as when they fall in love, start to explore the world, found a family, begin to work, take time to play and attain wisdom. This approach coincides with the introduction of a new Renault design language that takes its inspiration from the three keywords which communicate the brand's vision, namely 'simple','sensuous' and 'warm'. In keeping with this strategy, Renault's concept cars will progressively express this vision, paving the way for a product plan based on a coherent and clear offer. DeZir is the first project to be led by Laurens van den Acker and marks the implementation of the strategy based on the notion of 'life cycle'. The first step involves falling in love, an experience that is perfectly illustrated by DeZir's powerful, sensuous styling and bright red finish; red being the colour associated with passion. The result is a two-seater coupé which is both sculptural in spirit yet perfectly harmonious. DeZir's shape features prominent wheel arches that accommodate 21-inch wheels, the design of which took its inspiration from the notion of movement. 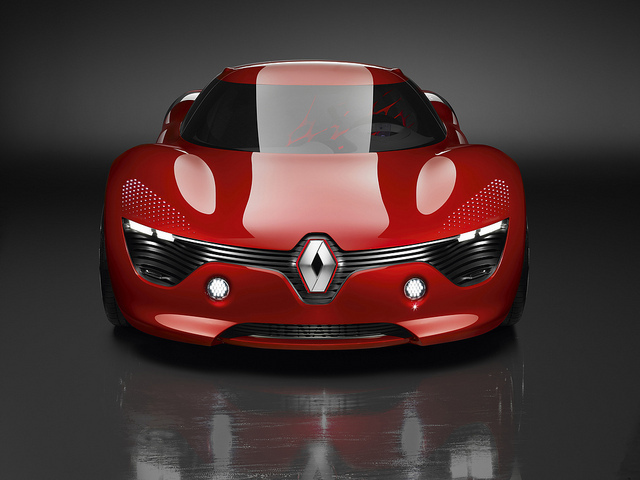 DeZir's front end features a full-width air-intake which strikes out either side of a large, vertically positioned Renault logo that proudly displays the car's brand pedigree. Meanwhile, the chrome finish of the diamond-shaped logo contrasts with the dark aspect of the grille to express the statement still further. The interior design also suggests lightness. "Love is a sentiment that lifts you; gives you wings," says Stéphane Maïore, who was in charge of DeZir's interior styling. "Inside DeZir, you feel like you're floating on a cloud," adds Stéphanie Petit, Colours and Materials Designer. The forms are soft and light, while the predominant colour is white, although there are also echoes of the same passion red used for the exterior. The one-piece, two-seater front benchseat provides cocoon-like comfort. To emphasise the sensation of a shared passion and lightness, it comprises a number of interlocking elements trimmed in white leather, with a quilted pattern on the passenger's side, and a contrasting uniform finish on the driver's side, as if to suggest an inexorable attraction between the two. that employed for Mégane Trophy race car.